The creation of a good audiovisual story is the result of conjugating a series of elements in a precise way, something very similar to drawing up an architectural plan; the duration of the shots, their temporal ordering, the interrelation of their parts and the progression of the whole… everything must follow an impeccable logic, not as an end in itself, but as a means to reach the audience, intellectually and emotionally.When we approach the editing in this way, we soon notice how we begin to discard useless material; choosing images, sounds and music for mere aesthetic impact do not lead us anywhere. Going back to the architecture analogy, it is as if we were trying to build from ornamentation. The ornamentation is necessary to any building, but it can only come after the structure.Let’s consider the editing process as the ordering of the bricks of a building; a brick in itself is not worth much… but a brick aspires to be part of something big and transcendent. A brick wants to become the Empire State Building, the Pyramid of Keops, the Cathedral of Notre Dame. The only thing that transforms bricks into a perfect work of art is the way they are arranged. The difference between a “video” and a Film, lies in the editing. 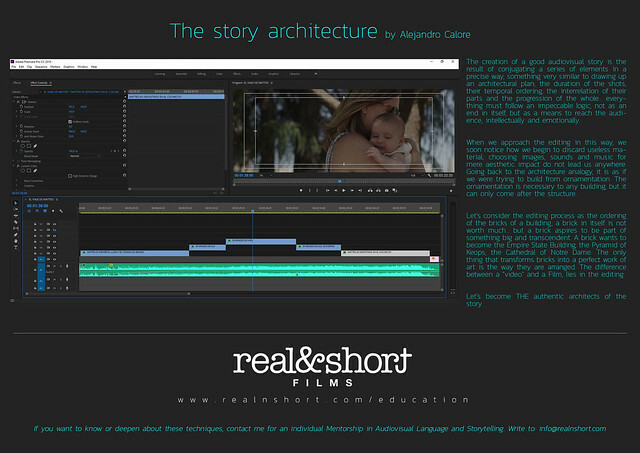 Let’s become THE authentic architects of the story.